Weather: There’s a 40 percent chance of showers today, and the National Weather Service predicts patchy fog over the weekend with temperatures in the high 30s. Sports: It’s a quiet weekend for high school sports. Wrestling is away at North Mason today. Basketball plays an away game Saturday. Hallelujah! Bainbridge Chorale will lead a “Messiah Sing-along” tonight from 7-9 p.m. at Rolling Bay Presbyterian Church. All are welcome to sing or listen. The chorale has some scores to share but extras are appreciated. The cost is $10. Christian Science Monitor correspondent and former islander John Thorne will discuss his latest assignments in North Africa from 10-11:30 a.m. Saturday at the public library. The event is free and open to all ages. 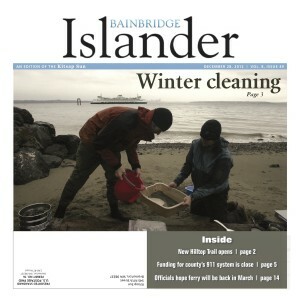 There are a couple of age-appropriate options for New Year’s Eve revelry on Bainbridge Monday. KiDiMu takes a preemptive approach to the holiday with its annual Noon Year’s Eve for youngsters. The museum will hold a special craft time from 10-11:30 a.m., followed by a countdown to noon and a balloon drop. For those 21 and older, Bainbridge Performing Arts will host a New Years Eve party featuring Seattle DJ Dubreezy. The bar will be stocked with island-brewed beer and spirits, and non-alcoholic drinks will be half-priced for designated drivers. The party starts at 9 p.m. Tickets are $15. Inside the Islander: Take a walk down the new Hilltop Trail. Local lawmakers are mulling gun control. The long-awaited Hilltop Trail is open, connecting two sections of Grand Forest. A Bainbridge woman’s bakery delivery service is among the first in the state licensed under the new Cottage Foods Act. Bainbridge High School graduates helped launch a national non-profit teaching financial literacy. The staffing headache continues Washington State Ferries. The Land Trust announced the purchase of 12 acres of shoreline property on Agate Passage. Coming Up: Happy New Year!